The weekend before last, I visited Kaiserslautern and Mainz; I have photos from Mainz and will blog about it separately later this week. Due to a train cancellation, my 2.5-hour direct train to Kaiserslautern was replaced with a three-leg itinerary via Karlsruhe and Neustadt that took 5.5 hours. Even though neither Kaiserslautern nor Karlsruhe is contained within the region, they are both served by the Rhine-Neckar regional rail network. After riding the trains I looked up the network, and want to explain how things work in a metro area that is not very well-known for how big it is. How polycentric is the system? The Rhine-Neckar is polycentric, but only to a limited extent. It does have a single central city in Mannheim, with 300,000 people, plus another 170,000 in Ludwigshafen, a suburb across the Rhine. With Heidelberg (which has 160,000 people) and many surrounding suburbs, the total population of this region is 2.5 million, about comparable to Stockholm, Copenhagen, and Hamburg. The liminal polycentricity comes from the fact that Mannheim has a distinguished position that no single central city has in the Ruhr or Randstad. However, Heidelberg, Neustadt, Worms, and Speyer are all independent cities, all of which have long histories. It’s not like Paris, where the suburbs were all founded explicitly as new towns – Versailles in the Early Modern era, and the rest (Cergy, La Defense, Evry, Marne-la-Vallee, etc.) in the postwar era. The rail network has the same liminal characteristic, which is what makes it so interesting. There is an S-Bahn, centered on Mannheim. There are two main trunk lines, S1/2 and S3/4: every numbered line runs on an hourly clockface schedule, and S2 and S4 provide short-turn overlays on the S1 and S3 lines respectively, giving half-hourly service on the combined lines. Some additional lines are not Mannheim-centered: the S33 is circumferential, and the S5/51 are two branches terminating at Heidelberg. Additional lines fanning out of Mannheim are under construction, to be transferred from the RegionalBahn system; already S6 to Mainz is running every half hour, and there are plans for lines going up to S9. However, it is wrong to view the Rhine-Neckar regional rail network as a Mannheim-centric system the way the RER is Paris-centric and the Berlin S-Bahn is Berlin-centric. The Mannheim-centered S-Bahn lines run alongside a large slew of legacy RegionalBahn lines, which run on hourly clockface schedules. The S3 serves Karlsruhe and the S1 and S2 serve Kaiserslautern, but this is not how I got from Karlsruhe to Kaiserslautern: I took a regional train via Neustadt, running on a more direct route with fewer stops via Wörth and Landau, and transferred to the S1 at Neustadt. Kaiserslautern is not really part of the Rhine-Neckar region. It is too far west. However, it is amply connected to the core of the region: it has S1 and S2 rail service (in fact it is the western terminus of the S2), and it has regional trains to Mannheim as well as to other cities within the region. The regional train from Mannheim to Kaiserslautern and points west is timed to leave Neustadt a few minutes ahead of the S1, as it runs on the same line but makes fewer stops. Other than the S-Bahn east, the trains all leave a few minutes after 8:30, and I saw them all arrive at the station just before 8:30, allowing passengers to interchange across as well as between platforms. Judging by static arrival boards posted at stations, this integrated timed transfer repeats hourly. Some of the lines depicted on the map serve cities of reasonable size, including Mannheim and Heidelberg, but also Homburg, the western terminus of the S1. Others don’t; Pirmasens is a town of 40,000, and the intermediate towns on the line as it winds through the Palatinate valleys have a few thousand people each. Nonetheless, there is evidently enough demand to run service and participate in the integrated timed transfer plan. As I’ve mentioned above, neither Kaiserslautern nor Karlsruhe is properly part of the Rhine-Neckar. Neither is Mainz, which is within the Frankfurt region. Nonetheless, all are on the Rhine-Neckar S-Bahn, and Kaiserslautern isn’t even an outer terminus – it’s on the way to Homburg. This is for two reasons. The first is that this is a new S-Bahn network, cobbled together from regional lines that were formally transferred to the S-Bahn for planning purposes. It lacks the features that bigger S-Bahn networks have, like strong urban service. The Rhine-Neckar is about the same size as Hamburg, where the S-Bahn provides 10-minute frequencies to a variety of urban neighborhoods; in contrast, the S1/2 and S3/4 trunk lines in Mannheim aren’t even set up to overlay to exact 15-minute frequencies on the shared segment to Heidelberg. I’ve talked about the distinction between regional and intercity service in the context of Boston. In Boston I recommend that some lines be run primarily as intercities, with long-range service and fewer stops, such as the Providence and Lowell Lines, both serving independent urban centers with weak inner suburbs on the way, while others be run primarily as locals, with more urban stops, such as the Fairmount-Franklin Line, which has no strong outer anchor but does pass through dense neighborhoods and inner suburbs. The same distinction can be seen in Germany, all falling under the S-Bahn rubric. Wikipedia has a map of all S-Bahn systems in Germany at once: it can be readily seen that Hamburg, Berlin, Munich, Stuttgart, and Frankfurt have predominantly local systems, while Hannover, Nuremberg, the Rhine-Neckar, and Middle Germany (where the largest city is Leipzig) have predominantly intercity systems that are run as if they were S-Bahns. The second reason owes to the urban geography of the Rhineland. Paris, Berlin, and Hamburg are all clearly-defined city centers surrounded by rings of suburbs. The Rhineland instead has a variety of smaller urban centers, in which suburb formation often takes the form of people hopping to a nearby independent city and commuting from there. All of these cities have very small contiguous built-up areas relative to the size of their metropolitan regions, and contiguous suburbs like Ludwigshafen are the exception rather than the rule. Moreover, the background population density in the Rhineland is very high, so the cities are spaced very close together. This enabled the Rhine-Ruhr to form as a polycentric metro area comparable in size to London and Paris without having any core even approaching the importance of Central London or central Paris. The Upper Rhine is not as industrialized as the Ruhr, but has the same interconnected network of cities, stretching from Frankfurt and Wiesbaden up to Karlsruhe. In such a region, it’s unavoidable that commuter lines serving different urban cores will touch, forcing an everywhere-to-everywhere network. To reinforce the importance of high density, we can look at other areas of high population density. The Netherlands is one obvious example, underlying Randstad and an extremely dense national rail network in which it’s not really possible to separate different regions for planning purposes. England overall is dense as well, but the south is entirely London-centric; however, the same interconnected network of cities typical of the Middle and Upper Rhine exists in Northern England, which not only invented the railway but also maintains a fairly dense rail network and has a variety of connecting services like TransPennine. Finally, the Northeastern United States has commuter rail line on nearly the entire length of the Northeast Corridor, touching in Trenton between New York and Philadelphia, with perennial plans to extend services in Maryland, Connecticut, and Rhode Island to close the remaining gaps. Switzerland has long had a national integrated transfer timetable, overlaying more local S-Bahn trains in the biggest cities. As long as there is more than one node in such a network, it is necessary to ensure travel times between nodes permit trains to make multiple transfers. This leads to the Swiss slogan, run trains as fast as necessary, not as fast as possible. This means that, in a system based on hourly clockface schedules, the trip times between nodes should be about an hour minus a few minutes to allow for transfer time and schedule recovery. Potentially it’s possible to set up some intermediate nodes to have transfers at half-integer hours rather than integer hours, allowing half-integer hour timed transfers. Switzerland’s main intercity lines run on a half-hourly takt, with timed transfers on the hour every half hour in Zurich, Bern, and Basel, which are connected in a triangle with express trains taking about 53 minutes per leg; additionally, some smaller cities have timed transfers 15 and 45 minutes after the hour. Germany’s rail network is less modern than Switzerland’s, and the Rhine-Neckar schedule shows it. S-Bahn trains run between Kaiserslautern and Mannheim in a few minutes more than an hour, which is why the S-Bahn train depicted in the photo above does not participate in the hourly pulse. In contrast, the regional express trains take 45 minutes, which allows them to participate in the pulse with a little bit of wasted time at Mannheim. Potentially, the region may want to level these two service patterns into one local pattern with a one-way trip time of about 50 minutes, through speeding up the trains if possible. A speedup would not be easy – the rolling stock is already very powerful, and the line is 64 km and has 16 stations and a curvy western half. Discontinuing service on the S2 to two neighborhood stations in Ludwigshafen, which the S1 already skips, is most likely required for such a hybrid S-Bahn/RegionalExpress service. However, it’s critical to stress that, while Germany is lagging Switzerland, Austria, the Netherlands, and Sweden, it is not to be treated as some American basket case. The Rhine-Neckar rail network is imperfect and it’s useful to understand how it can improve by learning from comparable examples, but it’s good enough so as to be a model for other systems in polycentric regions, such as New England, the Lehigh Valley, Northern England, and Nord-Pas-de-Calais. The reader may wish to refer to [this map](https://www.baden-wuerttemberg.de/fileadmin/redaktion/m-mvi/intern/Dateien/171130_ANLAGE_2_Gemeinsame_Pressemitteilung_Vergabe_Netz_6_b_Grafik.pdf) in order to better follow along with the text. So, having stared at the above maps, I ask: why did you go from Mainz to Kaiserslautern via Karlsruhe? I didn’t! I went from Paris to Kaiserslautern via Karlsruhe. I still live in Paris, you know. There are like 3 direct high-speed trains per day in each direction, I booked one of them, and it was canceled, so it was fastest to do a 3-leg trip than to wait for the next one. Why are the high speed trains not hourly or every two hours? I thought the high speed network in Germany is already closer to clock face schedules? Keep in mind that Alon came from Paris, and the French high speed trains, in particular the international ones, have a random schedule. The German high speed network does operate hourly. Both the trains I booked were ICEs, not TGVs, even though both times I ended up riding TGV Duplexes due to ICE cancellations. I think they’re part of a two-hour takt of trains between Paris and Frankfurt, of which some stop at Kaiserslautern and some don’t. 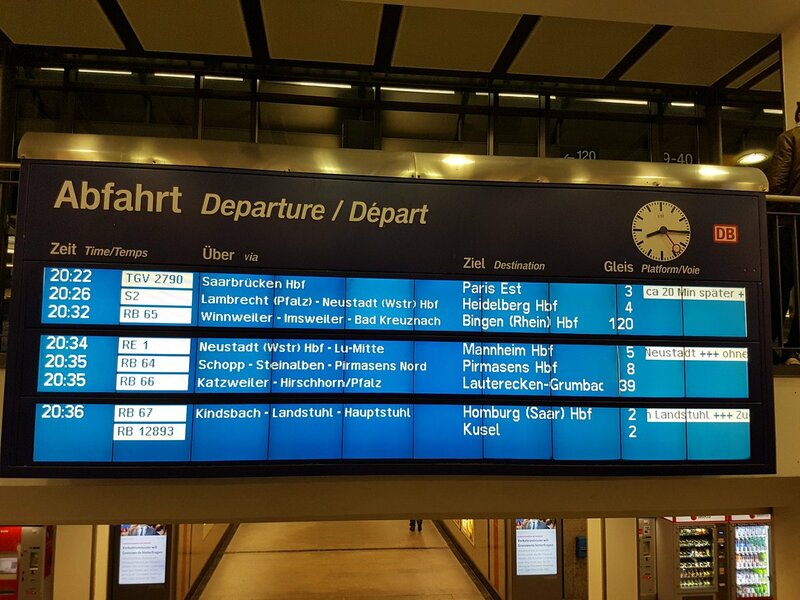 There’s a long-standing grandiose plan “until 2030” top enable Swiss style clock face schedules for all trains in Germany under the term “Deutschland Takt”. To me, it is relatively realistic, because the IC/ICE network is already im Takt, and there are several Länder where the regional services are already (such as the “Drei Löwen Takt”). What I saw in Rhineland-Pfalz looked like an hourly takt of RegionalExpress trains, as is what I saw in Karlsruhe on the train departure board. The rolling stock seems the same as on the S-Bahn: two DB Class 425s coupled together, sometimes splitting for two separate destinations. Actually, there is one case: S23 Bonn-Euskirchen. Currently operated with Talent DMUs; Electrification is planned, however. I also had Dachau – Altomünster in mind, but that line got an S-Bahn number only after the electrification (and it is now a branch of the S2). Before, it was Line A in the MVV network. There also was the old S2 in Leipzig (pre 2002), which ran with two-axle diesel railcars (Ferkeltaxen). In this case, there weren’t any EMUs of sufficient smallness available.